About: Maroush is a chain of upmarket Lebanese restaurants with authentic atmospheres that serve traditional dishes. They also offer a takeaway and delivery service. 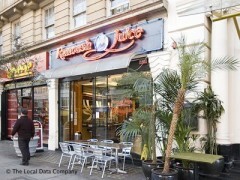 Ranoush is part of this chain and serves fresh fruit juices along side tasty Lebanese snacks.